When an assignment is set as a moderated assignment, the moderator can use the grade summary page to view all grades awarded by one grader and compare them to grades awarded by another grader. If anonymous grading is enabled for the assignment, the names of the students, graders—or both—may be displayed anonymously, respectively. You can select grades directly in the grade summary page. If a submission has only received one grader from one grader, you can bulk apply all grades from that grader. However, if a submission has received multiple grades from multiple graders, grades for each student must be selected individually. Moderated assignments are automatically muted in the Gradebook, and students cannot view any comments or grades until final grades are posted. Moderated grading is currently a course opt-in feature. To enable this feature, learn how to manage feature options in the course features lesson. 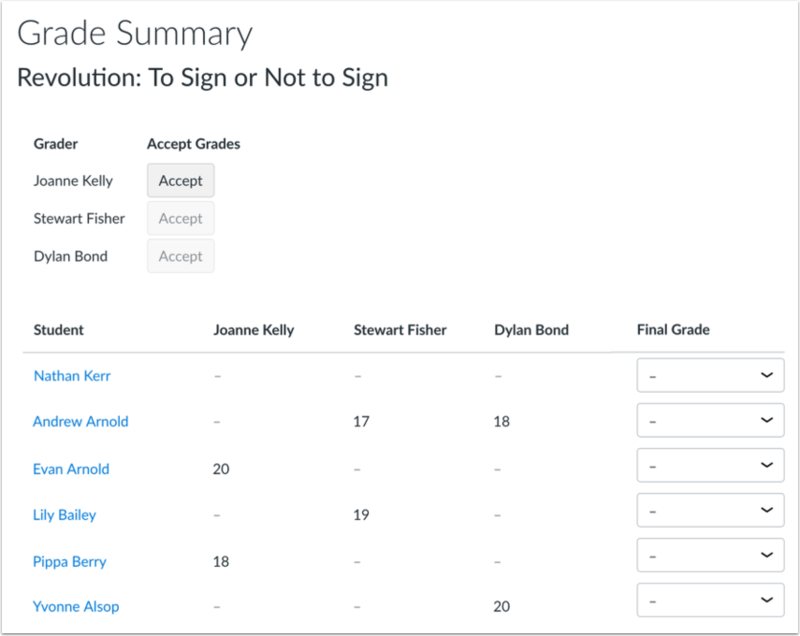 Moderated grades can only be managed directly through the grade summary page. Students can only view comments in the submission that is selected for the final grade; they cannot view comments from any other provisional grade reviews. If you want to include any comments from additional reviewers, you will have to copy the comments manually into the submission selected for the final grade. If a grader uses Canvas DocViewer annotations, students can only view the annotations in the assessment that was selected or copied as the final grade. In copied reviews, students can view the original reviewer's annotations as well as any annotations added by the moderator. Please note that if instructor annotations are marked as anonymous, instructor annotations and comments will not include the name of the instructor. Once grades are posted, the grade in the Grade Summary Page page cannot be changed; all content is considered read-only for historical reference. However, after final grades have been posted, grades can be changed in the Gradebook, if necessary. The Gradebook History page records all grade changes in the Gradebook and can be accessed at any time. Click the title of the assignment. Confirm all students have received a grade by a grader. If anonymous grading is enabled for the assignment, the names of the students, graders—or both—may be displayed anonymously, respectively. If you want to view a submission by a specific grader in SpeedGrader, click the name of the student. Note: If the assignment is also anonymous, the anonymized student names link to the submission for that specific student. If an individual student’s submission has only been graded by one grader, you can select all the grades from that grader as final grades by clicking the Accept button . Once selected, the Grade Summary page confirms the grades have been accepted . If a grader grades a submission that has already been graded by another grader, the Accept button for those graders will be grayed out, as one or more submissions have grading conflicts that you must resolve and assign an individual grade. Accepting grades for a grader cannot be undone. However, you can change a final grade assigned to a student by assigning a custom grade, if needed. If the Accept button does not display in the page at all, all graders have graded multiple student submissions, and all final grades must be selected individually. If a submission has received multiple grades, select the final grade for the student by clicking the Final Grade drop-down menu and selecting the preferred grade. If you want to enter a custom grade for a student at any time, select the grade in the drop-down menu . In the grade field , highlight the existing grade, and then type in the new grade according to the assignment's grading scheme. Click the Enter/Return key on your keyboard. The previously selected grade from the grader is saved and overrides the custom grade . When you are ready to publish grades, click the Post button. Note: Once a grade is published, the grade in the Moderate page cannot be changed; all content is considered read-only for historical reference. However, grades can still be changed in the Gradebook. Canvas confirms you want to publish grades to the Gradebook. To continue, click the OK button. Canvas confirms grades were posted to the Gradebook. Grades in the Grade Summary Page cannot be changed. 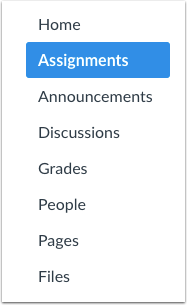 When you are ready to unmute the assignment and display grades to students, click the Display to Students button. Canvas confirms you want to display grades to students. To continue, click the OK button. Canvas confirms grades were unmuted and displayed to students. Previous Topic:How do I post final grades as a moderator for a moderated assignment with one grader? Next Topic:How do I sync grades to Banner? Table of Contents > Grades > How do I post final grades as a moderator for a moderated assignment with multiple graders? Re: Why can't I unmute grades?